Dr. Francisco J. Zagmutt, Managing Director at EpiX Analytics, has been appointed as a member to the National Advisory Committee on Microbiological Criteria for Foods (NACMCF). The committee has played a fundamental role providing impartial scientific advice to federal agencies. According to the committee's website, "NACMCF reports provide current information and scientific advice to federal food safety agencies and serve as a foundation for regulations and programs aimed at reducing foodborne disease and enhancing public health." Dr. Zagmutt is honored to join the NACMCF and will serve a two-year term in the capacity of providing expert advice to the US Departments of Agriculture, Health and Human Services, CDC, and several other agencies on the safety of domestic, imported and exported foods. Earlier this spring, EpiX Analytics presented a customized week-long risk analysis modeling class in Lagos, Nigeria. The course content was partly based on the World Bank Group's handbook co-authored by EpiX entitled, Risk Modeling for Appraising Named Peril Index Insurance Products. The course was part of the Global Index Insurance Facility's (GIIF) training aimed at risk analysts and focusing on risk modeling techniques for evaluating index insurance products. It is part of the World Bank Group's GIIF program that "facilitates access to finance for smallholder farmers, to strengthen the financial resilience for the poor against the impact of climate change and natural disasters, and to sustain food production for local communities and larger markets". Interested in a Course on Epidemiology and Food Safety? 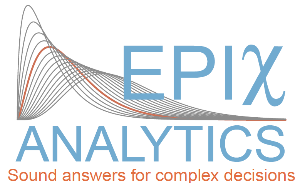 EpiX Analytics’ 5-day Epidemiology and Food Safety Risk Analysis training course has been taught for over a decade. The focus of the course is solving real-world risk analysis problems and to facilitate this, a variety of case studies are used to illustrate applications, good practices, and mistakes to avoid. Anyone with a basic knowledge of spreadsheets who is in the field of animal health, human health, microbial, antimicrobial, and toxicological food safety risk analysis can attend this course; also, statisticians, scientists, and information technology professionals who provide input to risk assessments. Please refer to the course content for more details regarding what is covered each day. You can register for the course on our website. If you have any questions, please contact us at training@epixanalytics.com. Sep. 10-14 Epidemiology and Food Safety Risk Analysis , Ft. Collins, CO, U.S.
Oct. 17-18 I ntro. to Quantitative Project Cost and Schedule Risk Analysis , Boulder, CO, U.S.
Oct. 22-24 Quantitative Risk Analysis for Translational Research in Drug Development , Ft. Collins, CO, U.S.
Dec. 3-6 Quantitative Risk Analysis with R , Ft. Collins, CO, U.S.